At Network Depot, we understand that many smaller companies do not have the resources to hire a full IT support team to keep everything up and purring like a kitten. This brings with it the need to decide if you should take on a smaller IT support staff, or outsource to a company like Network Depot. No matter which avenue you decide to go down, there are several questions and considerations that need to be made when selecting the perfect candidate or outsourced team. Our 20-plus years of experience has allowed us to understand which types of issues are most important for each type of company, which virtually always enables us to satisfy these concerns, and give you the confidence to know you have the most suitable team of professionals at your back. No matter which area of business your company operates in today’s fast-paced world, it is virtually guaranteed that you will use technology at some point, in some capacity. It could be something simple, such as basic electronic storage to keep all of your customer and sales information organized and accessible by all members of your corporate team. Or, it could be tons of intricate computer networks and devices, all of which are necessary to keeping your company on the most successful track. No matter how much technology you use, it will need servicing at one point or another. Which Type of IT Support Do I Need? Before you can even begin to interview potential candidates or outsourced parties, you need to understand and decide which type of ongoing support will best suit your company’s setup and overall tech support needs. 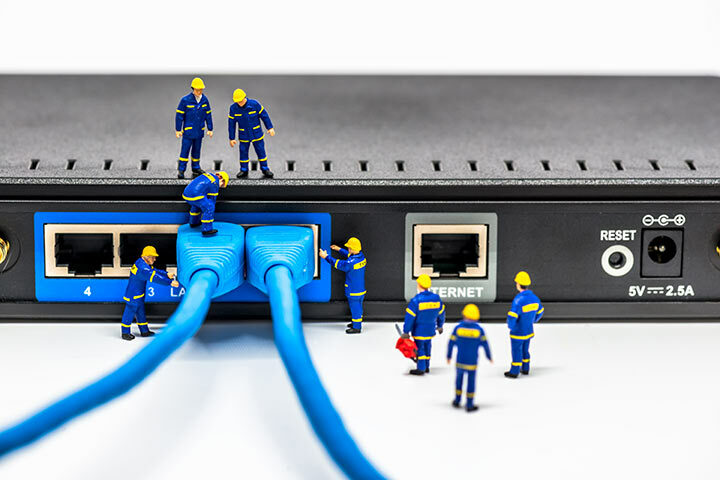 The two primary choices are a dedicated person or team, or a company whose sole purpose is to provide IT support for their clients, such as Network Depot. Having a dedicated person or team does have a clear advantage when it comes to familiarity of the way your company runs on a much more intimate basis. Because the focus of this type of support is solely on your individual needs and wants, and is an actual part of the company, it is bound to understand how things work in your unique setup than someone from the outside. There are, however, many more advantages to outsourced it services, which has made this form of support the leading choice for small to medium-sized businesses. Costs include only the price of the support, with no need to offer a benefits package as part of the deal. Service is guaranteed 24 hours a day, something frequently unattainable if you have the single person most smaller companies elect to utilize. Nothing spells disaster like a serious IT problem while your tech support person is on vacation. Experience and knowledge with all facets of technology is also usually much higher with an outsourced team. Many companies have members that are focused on different areas of tech, giving a much broader pool of knowledge to work with. Another area that needs to be solidified before you can actually begin to interview prospective companies or candidates is a complete understanding of what your IT support needs actually are. It is extremely difficult to relay to people or independent contracting agencies what you need if you do not know yourself. While you may not have the technical expertise to fully explain every detail, a basic and complete description will be all a knowledgeable candidate needs to understand what you are looking for. This allows both parties to avoid wasting each other’s time if they do not possess the necessary skills or experience to fulfill your needs in their entirety. If outsourcing is what you decide to go with, knowing where both offices and data centers are located can give you an idea just how quick of a turnaround time you can expect for problem resolution. While most problems can be resolved remotely, some fixes just need someone to come out and perform them on site. Multiple data centers, at different locations, can prove redundant, if a problem occurs at one location, others can step in to take up the slack. A complete understanding of how the prospective company is set up will allow you to make the most informed decision on whether it is right for you. As with any service-oriented position, contact with other employees is an integral part of the duties that need to be performed. The average employee can get downright grouchy when it comes to computer problems, given how confusing and frustrating they can be. Whether it is a single person or an outsourced company, the ability to handle these types of situations with courtesy and professionalism can spell the difference between an easy and painless fix and one fraught with interdepartmental friction and turmoil. An excellent way to gauge the typical response for a difficult request is to role play a likely scenario. While the circumstances will have them on their best behavior, it is possible to get a general feel with how they are likely to respond. Nothing creates more tension and frustration than an IT person that speaks only in tech jargon, and not words that the average layperson can understand. How Do You Handle Different Areas of Tech Support? Understanding how a potential candidate will handle the most important areas of IT support gives clear insight on whether or not they are right for your position. Following are several of the top areas that need to be examined before you give the go ahead. The individual help desk system used by potential candidates can give you insight into their possible efficacy and overall work ethic. Virtually all IT support personnel or agencies use one of the many different suites of help desk software that are currently available, each of which has its pros and cons. Check to see if the versions they use are the most current, a failure of which can potentially hint at a laxness that can make things difficult for your company. Also, if you have found a specific type of software works the best for your setup, and the potential party uses something different, how willing/able are they to make the switch? Flexibility, and the ability to evolve under changing circumstances, are necessary traits if you want the most suitable candidate for the job. Given just how important the security, safety, and dependability of your data is to the operation of your company, make sure to find out how they handle network care and security. Firewalls and antivirus software and hardware must be of top quality and efficacy, a failure of which could allow nefarious characters to plunder the wealth of information you have gathered. Ensure that there is also a system in place to keep employees from accessing unsafe content, another primary door for hackers to slip into your network. Backing up your data is just as important as keeping it safe from outside parties, with a loss of information and files due to equipment or user error a true catastrophe. How often, and where, each backup occurs are important considerations to make when deciding if the potential party will keep things with the utmost in accessibility. Restoration is the opposite end of this coin, equally as important, and subject to difficulties if the proper steps are not taken. Knowing that even a serious equipment malfunction will not hamper you from reaching mission-critical data, no matter when it is needed, is a vital key to running your business at the peak of success. Another area of prime importance is how actual fixes are implemented. The two usual methods are remotely and on site, each appropriate for different types of problems. Make sure both options are available, and under which circumstances each will be used. Remote options usually include software that must be installed on the affected machine prior to trying to repair problems or damage. Make sure this software is not excessive in size, something that will usually result in slow systems. Do You Offer Mobile Solutions? With the rise of mobile computing devices in general, and the smartphone in specific, has come a steady increase in the tendency to perform work outside the office. These situations vary, from operations whose employees work out of the office almost completely, and those where it is just a matter of checking interoffice communications from time to time. In each case, large or small, a comprehensive mobile computing platform is vital to achieving the most reliability when it comes to accessing internal data in a remote capacity. The proper mobile platform defines which users can access which data, and that all connections are available and running and peak efficiency no matter where the employee is. Do You Have Cloud Solutions? Using cloud computing is one of the most effective ways to cut costs associated with the purchase and upkeep of expensive equipment, all while sacrificing none of the power and performance they bring to the table. In fact, unless your organization has the resources for a really expensive network setup, the cloud outperforms most hardware found in the average business. As such, taking advantage of this power, in at least come capacity, is a prime consideration when taking on new IT support staff or contractors. Make sure that not only is the cloud platform easy to use and powerful, but also stable and secure. If your company does have its own network computing equipment, whether it be a large server farm or a small local server, it is important to make sure that the party in question is able to service hardware as well as software. Knowing the internal workings of the devices that store and administer critical data is a quality that must be possessed in order to make sure your service is all inclusive. Finding and hiring either a full time IT support staff, or their more popular outsourced counterparts, can be frustrating and confusing if done on your own. If you would like to hear about what Network Depot can do to satisfy any support services you could possible have, we urge you to contact us through our website, or by phone, whenever it is convenient for you. We will be happy to answer all of your questions, as well as schedule a consultation if you are ready.